How much do you know about Transportify’s closed vans for delivery service? Here at Transportify, we value client awareness about our services, pricing, and vehicles. Transparency with our prices builds customer trust, and client awareness helps make transactions more convenient. With these in mind, we aim to inform our current and future clients about the biggest vehicles we have available: Transportify Closed Vans. Clients who have frequented our Fleet & Pricing page often see that there are two truck models under the Closed Van Option: Elf and Canter. Although both are available in 4 wheels and 6 wheels, and both have the same maximum capacity, it is important to note that these two Transportify trucks have slight differences. According to carused.jp, a Japanese website for Japanese-made cars, Isuzu Elf trucks are powerful but easy to drive with light engine noise. These also have strong and stiff seats. However, Mitsubishi Canter trucks have very durable engines, solid engine noise, and comfortable seats. Known for their large sizes, these closed vans could carry as many as 31 XL balikbayan boxes (200cm long x 180cm wide x 190cm high x 7m3 volume), which is approximately equivalent to a complete sala set composed of a sofa and a couple of armchairs. They could even withstand a maximum weight of 1700kg. If you need more space, you can also use the Extra Space service that can accommodate packages equivalent to 62 XL balikbayan boxes (280cm long x 205cm wide x 205cm high x 12m3 volume), enough space for a King Size bed. It also allows up to a maximum weight of 1900kg. Standard fare for Closed Vans starts at P2100 flat for the first 3 kilometers, and an additional P50 per succeeding kilometer. Of course, Extra Services are available. The Add Destination service only costs P100 per additional destination with a limit of 10 destinations. The Extra Space service mentioned earlier has a flat fee of P400. One Extra Helper is already provided to help the delivery driver partner, but if you want to go for a Second Extra Helper, it will cost P200 per destination for 1-2 stops, and P50 per destination for 3-10 stops. The flat price for renting the Transportify Closed Vans for a full day is P6000. This option covers 10 hours of a day. If you wish to rent the truck for more than 10 hours, there will be a fee of P150 for every hour beyond the given 10 hours. For Extra Helper service, there is already one Extra Helper provided for the driver and availing a Second Extra Helper will cost P400 per helper. No need to worry about destination limit, too. A Full Day Option grants clients unlimited destinations as long as the destinations are within the Standard Service Area. For destinations outside the Standard Service Area, you may contact our customer support for inquiries. Going for the Closed Van Delivery Option has a number of benefits. For one, they are very efficient for big and heavy appliances or furniture like two-door refrigerators and four-poster beds. Another benefit is that one extra helper is automatically provided for both Standard Fare and Full Day Options. Truck bans are not much of a hindrance since our delivery driver partners are trained to find the quickest alternative route possible. 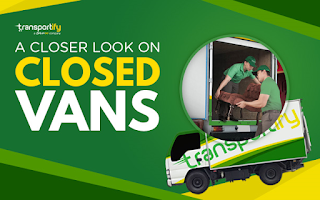 Here at Transportify, we make sure that even our biggest vehicle models from the Closed Van Option can be flexible enough to fulfill our promise in giving the best immediate delivery services in the Philippines. To learn more about our performance in the logistics and startup business industry, you can watch our interview with Bloomberg TV Philippines’ show Bright Ideas.